I had an invitation recently to address an executive summit on Shopper Experience on the subject of In-Store Implementation. Regrettably, the event did not materialize, but the thought process it inspired could not be stopped. I decided to capture some of it here in the Tirades. If you have ever shopped, of course you are. Shopper Experience is one of those big ideas that is hard to define because it encompasses everything we encounter in connection with a retail shopping visit. It begins with the traffic on the drive to the store, takes in the sights, sounds and smells of the store environment, and layers on the actions that take place while we are there. It probably even extends to the drive home and the interaction with purchased products. A large and complex construct, as the consumer behaviorists might say. To my mind, Shopper Experience cries out for a bit of de-construction. I took a crack at it. 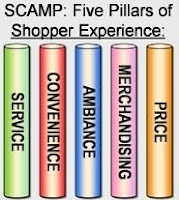 As I see it we can break down the shopping experience into five “pillars” or components. Taking each in turn may make the whole concept easier to grasp for purposes of analysis. More importantly, it may lead us toward practical ways to improve the whole shopper experience by optimizing its elements. Service. 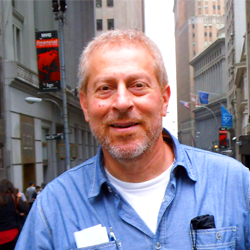 People, practices, policies, and the training that enables them. Top performing retailers excel at both hiring the right people and setting service practices that sustain and support their success. Convenience. Both time-saving and effort-saving. Sometimes the line between time and effort may be blurred with other pillars – as when it takes too much effort to locate a desired product. Is that a merchandising problem? Ambiance. Physical design of store environment, including lighting, spaciousness and other sensory cues like temperature, odors, and sound. And yes, other patrons figure into this experience pillar – we tend to like to shop with people like ourselves. Merchandising. The product assortment; their arrangement on shelves or displays; all associated messaging designed to inform and persuade. Price. Base or every-day pricing and store price positioning, of course, but also promotions and markdowns when they occur. Shoppers tend to form a relative price-value perception or price image for each retailer based on all these cues. SCAMP is submitted for your consideration. I find it a useful first cut at analyzing Shopper Experience. Of course, each of the five pillars merits much more detailed discussion. That’s an opportunity for future Tirades. Great post. I’m curious if you’d alter your 5 pillars or their descriptions to include the increasing use of technology – particularly mobile – in the shopping experience. Social, mobile, local and search technologies are making the boundaries of the store much more porous. I have labelled this phenomenon The Incredible Dissolving Store. This certainly has profound implications for understanding Shopper Experience. I believe the framework holds nicely, even as the context is transformed. But you are correct about continually reexamining the descriptions and techniques of each pillar. The shopper’s definition of convenience certainly is evolving in part due to mobile connectivity – as are price perceptions and expectations about service levels and assortments – to name a few areas of dynamic change. I could go on (and often do!) but let me just conclude by thanking you for your interest.